One of the things I love about gaming as a hobby is when people get creative with it. I’m not a big trading card player — when Magic: The Gathering was big, I was saying that The Primal Order was going to be the future of Wizards of the Coast. (This is why I’m so in demand as a prognosticator.) I hear a lot about the difference between playing a computer card game like Hearthstone and a game with real cards like Magic but I never thought to do what MTG_Reddit did with Paper Hearthstone. 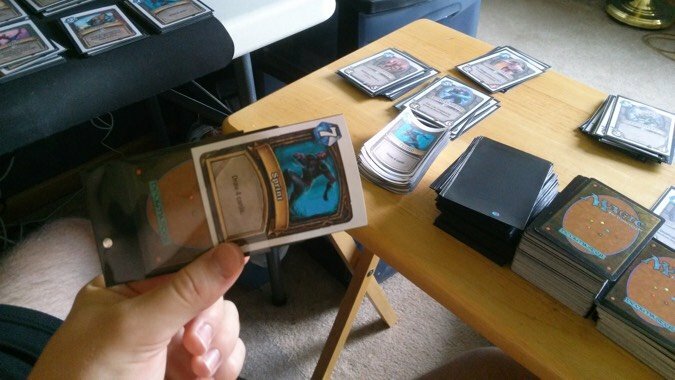 He printed out all the currently available Hearthstone cards and made a physical Hearthstone deck. One he could actually play with friends sitting around a table. The project is pretty extensive and MTG_Reddit has the details online. Hearthstone is a very automated game online, so there had to be some houserules to adapt it to the tabletop experience. He printed over 2250 cards, using extant MtG cards for backing, and it took him roughly sixty hours to go from start to finish (one assumes spaced out over a period of time). What interests me the most are how he and his friends playing tried new modes of play, like a ‘Commander-style, 5 man free for all’ match. This is a strength of a game that takes place outside of a computer and I’m interested in what else they can get up to with the game unshackled from its roots. It’s pretty ingenious and I wonder if Blizzard would ever consider it. Ever since the WoW TCG went away, I’ve missed the real world collectible aspect of that game. Hearthstone is its own beast, and the online nature of the game is baked into it, but I find experiments like this one really stretching the boundaries of what’s possible and that’s something gaming can still provide. Tinkering with something, and making it new in the process.